Oops, it's been nearly a week since I was last here. Latest on my foot and ankle, just because I know you are really so interested in my health and well being LOL! I had the CT scan on Monday and it was good news. Nothing was displaced so I didn't need any surgery. However, as I suspected it did show lots of other broken bones that were crushed. I have one broken toe, two broken metatarsals, a broken cuboid, all the of the cuniforms are broken and the tip off the medial malleolus of my tibia is broken, so 8 breaks in total. I'm also heading back to work on Monday. I'm looking forward to being back as I feel like I lost touch with the place a bit, but I know I'm going to be pretty tired at the end of the day as I've been doing a lot of sitting around as well as little naps during the afternoon. It will be an interesting week. Onto today's nail art, and I'm so happy with how this one turned out. 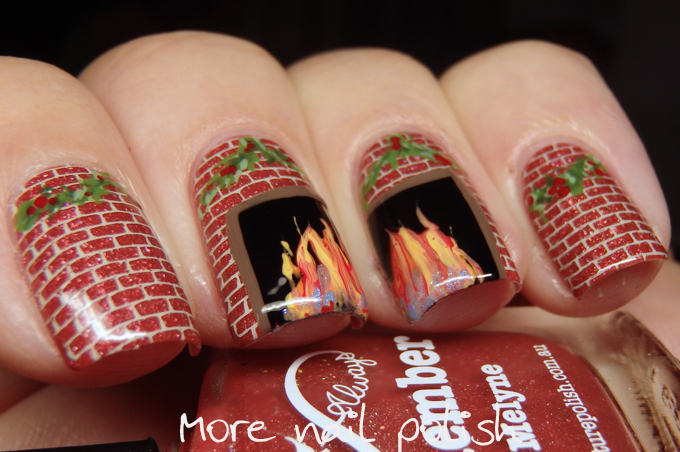 The prompt for the 26 Great Nail Art Ideas challenge this week is winter warmth, which in it's self is difficult for me, given that we just had a run of 30+ days and it's still a few days from summer here. You really can't beat Australian weather, it really is the best place in the world to live! 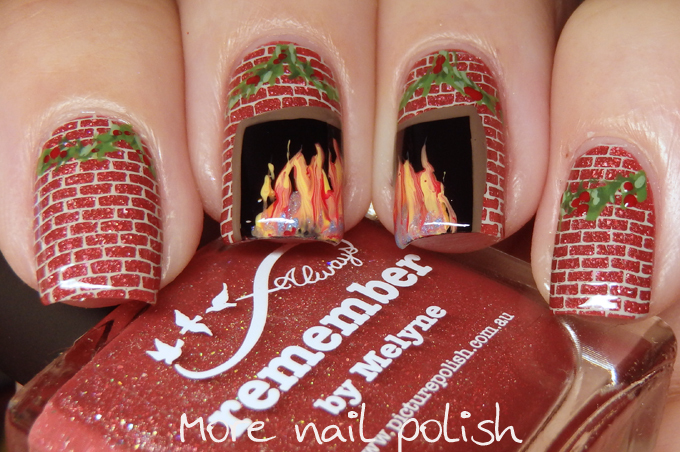 For my winter warmth nails I created a brick fireplace, and decided to Chrismassy it up a bit by adding a garland along the top. I love how this turned out. 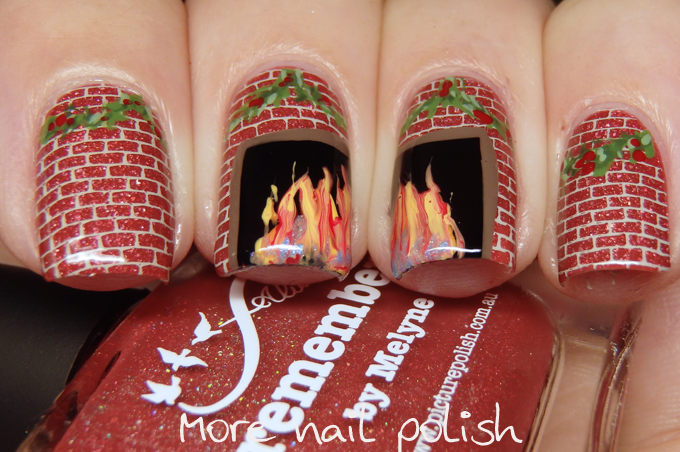 I feel like I could just toast some marshmallows right here on my nails! 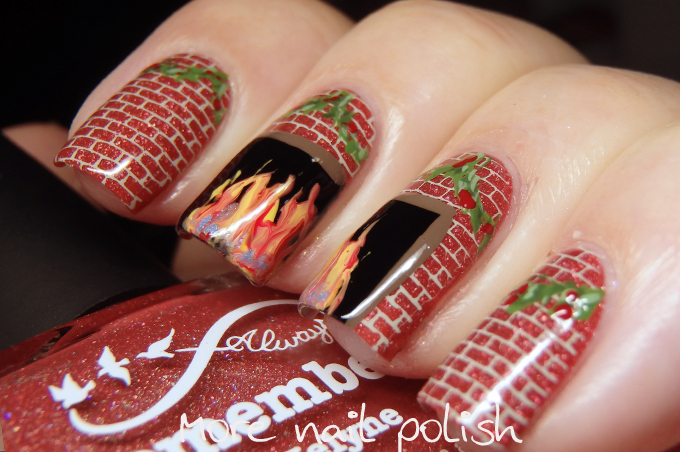 This mani is awesome! I hope your foot doesn't take too long to heal, 8 breaks sound aweful. Feel better soon! Oh my goodness! I love these!!!!!! Seriously they are perfect! Ahhhhh!! !